A heat pump is a central air conditioning and highly efficient heating system that will "extract" heat from the air in the winter time for cost effective heating comfort in all but the most severe winter climates. The system "reverse-cycles" in the heating mode and captures heat from outside and "pumps" it into your home. Unlike a furnace it doesn't burn fuel to make heat - It simply uses electricity to move heat from one place to another. In the cooling mode, an air conditioner simply captures heat from inside your home and transfers it outside. 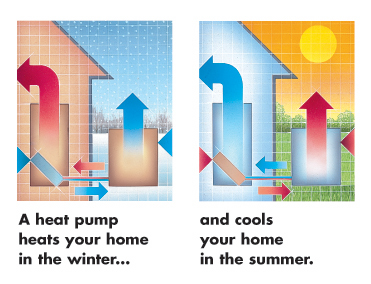 In heating, a heat pump "reverse-cycles" and captures heat from outside and moves it inside. This process is more efficient than electric heat as it is much less expensive to transfer existing heat than to actually generate it. There is usable heat in the air down to about 0 degrees Fahrenheit. It feels cold to us because our skin temperature is 98.6 degrees. A heat pump's heating capacity is rated at 47 degrees ambient (outside) temperature. As the outside temperature drops the heat pumps capacity drops in a linear fashion relative to the outdoor temperature. Most heat pumps will produce about half of their rated capacity at 12 degrees ambient. An electric heating element provides supplemental heat to assist the heat pump as its capacity declines. The heat pump monitors both the outdoor temperature and inside supply air temperature and energizes the assist as needed, automatically.